OK, I am now showing my age here, but back in the day when I was a Teenager and tearing about on a Suzuki AP50 with Clubman Handlebars and an expansion chamber screaming its heart out, there was a song that always seemed to want to make me get out on my machine and open it up for all its worth. This was a Huge influence in my life and still is today, as soon as I hear the song I sing to it every time. Well , a mate of mine who resides in Belgium now is a good buddy of Rinus and whilst they were chatting, my buddy Gerard Haitsma , then showed him a magazine that i was in and he said that he loved Cafe Racers. So much in fact, here is Rinus sporting one of MY tee shirts and looking at the magazine, this guy is a legend to me and I am so stoked that he likes what we do here at Carpys Cafe Racers. To think that this guy is wearing my shirt and that I used to listen to that song so many times a day back in 73 is really such a cool feeling. Here is the man himself in his studio- sporting one of my shirts. To think he knows what I do for a living and digs it really is such a superb feeling, thank you so much Rinus. On August 9th of 1946, Marinus Gerritsen was born in the Hague. When he was fourteen, he and his neighbor and schoolmate George Kooymans started meeting regularly to jam and write songs. Together with the later addition of Barry Hay and Cesar Zuiderwijk, they were to form the band that would become Rinus’ life. 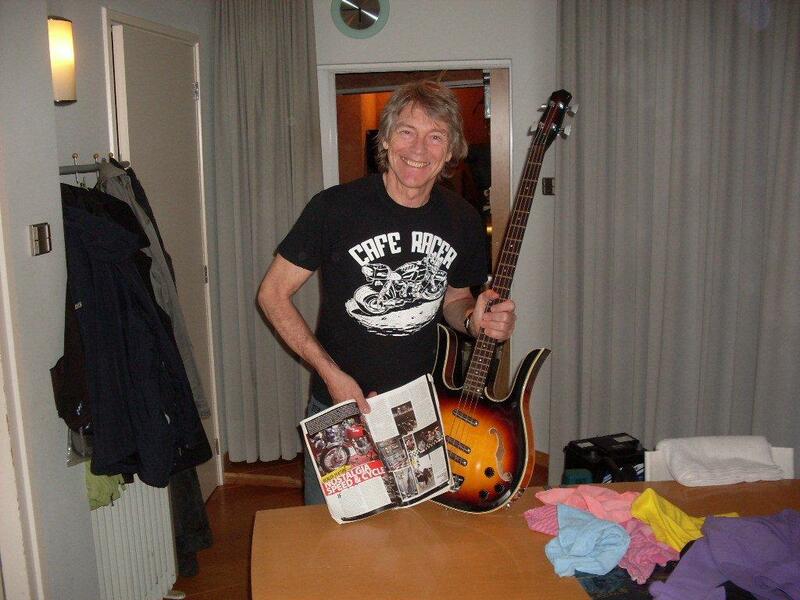 As bassist and occasional keyboard and harmonica player, Rinus would play an integral role in the development of Golden Earring’s sound.Gigs at locals dances and school functions gradually grew to larger and more notable venues, and Rinus quickly established his status as a bass player to be reckoned with. Already he was challenging the bassist’s conventional role, taking on more than the traditional job of holding down the low end – Rinus brought the bass into the foreground of the music. His solos were dynamic and super-intense, and the fervid energy with which he performed them live left audiences awestruck. His unique style attracted the attention of popular American guitar player Jimi Hendrix, who tried to recruit Rinus for his own band. But Rinus was devoted to the Earring and the creative development of their work, which was growing more and more sophisticated.Rinus was also the first in Dutch pop music to play a Danelectro bass guitar. For many years the love-worn Danelectro Longhorn was a significant part of both his sound on record and his stage persona. Tragically, in 1977, it was stolen from a New York hotel room; a heartbreaking blow for someone so attached to his instrument. A few years later it was replaced by a large double-neck bass guitar constructed by his father, who was an engineer. 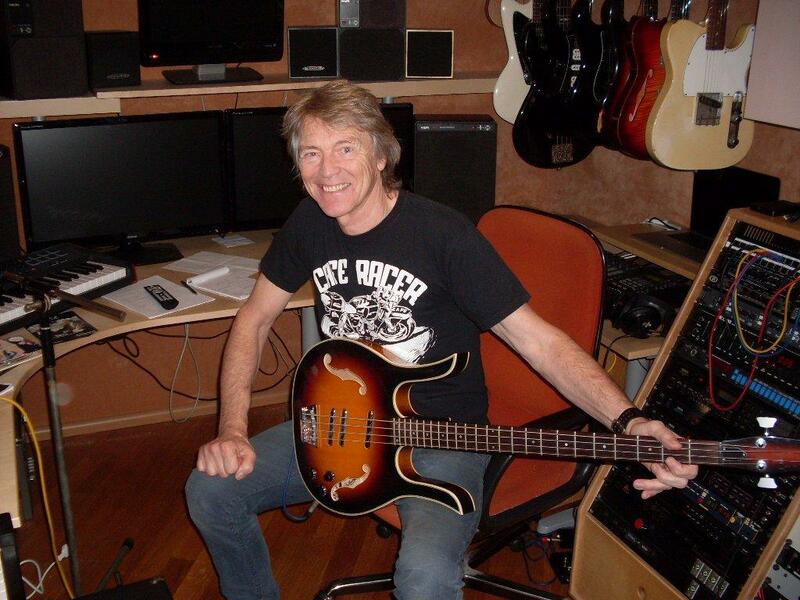 Rinus worked with his father to build many of his bass effects. Rinus hadn’t composed songs on any Earring records since the early days before Barry Hay and George Kooymans took on the task between them. But on 1989’s Keeper of the Flame, Rinus’ songwriting re-emerged full-force, with such contributions as “Distant Love” and the achingly beautiful “One Shot Away From Paradise.” Rinus also proved his truly exceptional bass playing skills yet again during the unplugged shows of the early 90s, mastering both acoustic and upright basses. In 1999, misfortune struck again. This time Rinus’ bike crashed into a bus, and consequently he suffered from a fractured pelvis. It was another setback. But not something he couldn’t overcome. Rinus is now living in a small place near the Hague with his wife, two daughters and a dog. He’s been a vegetarian for 25 years. He has his own recording studio and occasionally composes music for radio and television commercials, in addition to his work with the Earring. This entry was posted in Blog and tagged 70s Rock band, cafe racer, Golden Earing, legends, Marinus Gerritsen, music, radar love, rockers, ton up.